Coverage: Live on BBC One Wales & S4C, commentary on Radio 5 live sports extra, BBC Radio Wales, BBC Radio Cymru & BBC Sport website and BBC Sport app, plus live text commentary. 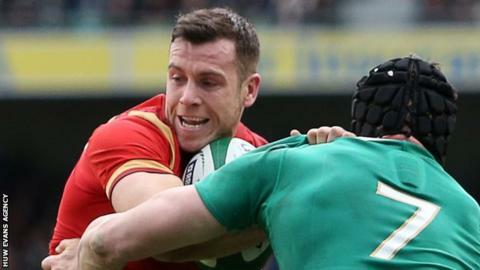 Wales scrum-half Gareth Davies believes a "high tempo" approach can bring them a win against France in the Six Nations on Friday. Both teams are unbeaten after the two opening rounds with France boasting two wins to Wales' draw and a victory. "Our game plan is always to play some rugby, a high tempo game," the Scarlets half-back. "If we can do that Friday they're going to be blowing and hopefully we can make the most of that." Wales opened the tournament with a 16-16 draw against Ireland in Dublin and went on to beat Scotland 27-23. France kicked off coach Guy Noves' reign with a win over Italy and narrowly beat Ireland, also in Paris, and on Friday they are away for the first time in this year's competition. Davies expects France to be more physical than Wales opponents so far, posing a bigger challenge up front. "They're a lot more forward orientated team so I think our pack are really going to have to man up. "I'm sure if they can do that, us backs can do the rest of the work for them." Wales hope their injury worries will ease before coach Warren Gatland names his team on Wednesday. Centres Jonathan Davies (hip) and Cory Allen (ankle), lock Luke Charteris (knee) and back-up fly-half Rhys Priestland (dead leg) are doubts. But no matter which players are involved, Davies says Wales can improve. "We weren't very happy with the way we played against Ireland, but against Scotland we showed a bit more of what we can do - we scored some decent tries," said Davies. "Maybe we left a few opportunities out there - hopefully we can execute a bit better against France. "If we get our own house in order I think Friday night we'll come away with a good win."